White Dwarf Stars photographed by the Hubble Space Telescope. A White dwarf is the electron-degenerate remnant of a star that has exhausted the nuclear fuel in its core and subsequently lost its outer layers. It represents the final stage of stellar evolution for most stars, including our own Sun. White dwarfs are extremely dense - a white dwarf with a mass equivalent to our Sun would be compacted into a volume no greater than the Earth. As there is no more thermonuclear fusion within white dwarfs, their only source of light and heat is leftover thermal energy. Typically any star between 0.5 and 8 solar masses will end its life as a white dwarf. 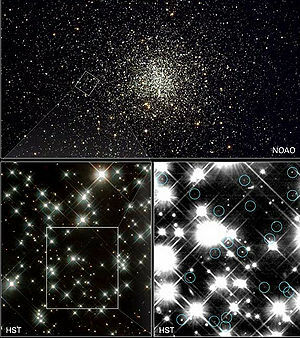 Most of these dwarfs are primarily made up of carbon and oxygen, however stars of 4 solar masses or more will have the ability to fuse carbon, which will result in a white dwarf chiefly made up of oxygen, neon, and magnesium. Any star greater than 8 solar masses will eventually develop a core that will be too massive to support by electron-degeneratcy (the Chandrasekhar limit) and collapse. This collapse will result in a supernova, and depending on the star's mass, the end result will be a neutron star or a black hole. When star that has a mass of less than 8 solar masses reaches the end of its life on the main sequence by consuming all of its hydrogen fuel in the core, all but the least massive (less than 0.5 solar masses) will enter the red giant phase of its evolution. At this point the core of these stars will become hot enough to fuse helium into carbon and oxygen. For most of these stars, the core will cease fusion once all the helium is consumed, not having the sufficient mass to raise the temperature enough to fuse carbon. For the heaviest stars under 8 solar masses though, carbon fusion will occur, but once all the carbon in the core is consumed, there is not enough heat to fuse the heavier elements available (usually oxygen, and neon). At this point the star will have a carbon-oxygen core (or for the higher mass stars, an oxygen-neon core) surrounded by an inner shell of helium and an outer shell of hydrogen. The shells of hydrogen and helium will then be expelled and form a planetary nebula around the star, exposing the remnant core which is the white dwarf the vast majority being the carbon-oxygen variety. Helium dwarfs exist as a result of mass loss in a binary system. The helium white dwarf SDSS J091709.55+463821.8, the least massive white dwarf known is an example of this. It is part of a binary system where most of its mass has been lost to its more massive neighbor. Stars with less than 0.5 solar masses will never be able to fuse helium in their cores once all the hydrogen fuel is consumed. It is theorized that they will also become helium white dwarfs, chiefly made up of helium-4 atoms. Because such low-mass stars have such a long lifespan (on the order of around one trillion years for a low mass red dwarf), it is believed that none have completely consumed their core hydrogen fuel yet. As a white dwarf is no longer powered by thermonuclear fusion, all the light and heat generated is from remaining thermal energy. Thus, the star will very slowly cool over time into a hypothetical black dwarf, where it can no longer emit light or heat in significant quantities. As the time period required for this to occur is longer than 13.7 billion years, no black dwarf is expected to exist yet. Even when the black dwarf state is reached, the stellar remnant itself is still expected to continue to exist indefinitely. A white dwarf that is part of a binary system may gradually draw in matter from its companion star. If it accumulates enough mass to exceed the Chandrasekhar limit it will explode in a type Ia supernova. What remains is an even denser object known as a neutron star. White dwarfs range in mass from 0.17 to 1.33 solar masses with the majority between 0.5 and 0.7 solar masses. Their volume though is roughly that of the Earth. As such, a typical white dwarf has a density of 1×103 kg/m3 which is around 200,000 times the density of the Earth or one million times the density of the Sun. This density is brought about by gravity crushing the electrons of atoms together. Normally electrons with the same spin cannot occupy the same energy level, therefore only two electrons can occupy a single energy level (as electrons can spin only one of two ways). Because in a white dwarf the electrons are forced so closely, all the energy levels of the atoms are filled with electrons, and because no more than two electrons can fill the energy levels in the atoms within the white dwarf, the star becomes degenerate. At this point, there is insufficient gravity to compress the matter any more, as quantum mechanics will not allow for it, preventing the white dwarf from collapsing any further, stabilizing it. Gravity at the surface of a white dwarf is around 100,000 times that of the Earth, the result is that heavier atoms in the atmosphere will sink into the surface, leaving only the lightest elements behind. Thus the thin atmosphere is made up mainly of hydrogen and helium. The temperature at this surface can range from 40,000 to 8,000 K, although white dwarfs as cool as 3,900 K have been found. The cooler the white dwarf, the older it is likely to be as they lose thermal energy over time. The surface itself is composed of a crust of carbon and oxygen, the bottom of which is believed be a crystalline lattice. There are several ways to observe white dwarf stars. The first white dwarf to be discovered was found because it is a companion star to Sirius, a bright star in the constellation Canis Major. In 1844, astronomer Friedrich Bessel noticed that Sirius had a slight back and forth motion, as if it was orbiting an unseen object. In 1862, the optician and telescope maker Alvan Clark observed the predicted companion. This star was later determined to be a white dwarf. This pair are now referred to as Sirius A and B, B, being the white dwarf. The orbital period of this system is about 50 years. Adriaan Van Maanen discovered the first lone white dwarf in 1917, now named after him as Van Maanen's Star. Over time, several other faint white stars were discovered to have high proper motion, indicating they were relatively near the Solar System, confirming them as white dwarfs as well. The term white dwarf itself was first coined by Willem Luyten in his observation of these stars in 1922. By 1939 18 such stars were known, increasing to over 100 by 1950, and over 9,000 known today. The Hubble Space Telescope, with its 2.4 meter mirror and advanced optics, has been successfully viewing white dwarfs with its Wide Field and Planetary Camera. In August 1995, this camera observed more than 75 white dwarfs in the globular cluster M4 in the constellation Scorpius. These white dwarfs were so faint that the brightest of them was no more luminous than a 100 watt light bulb seen at the moon's distance. ↑ the evolution of low-mass stars. Retrieved on 2019-03-22. ↑ Late stages of evolution for low-mass stars. Retrieved on 2019-03-22. ↑ 6.0 6.1 White dwarfs. Retrieved on 2019-03-22. This page was last modified on 22 March 2019, at 14:14.